A blend of Pure Essential Oils including Clove, Vanilla, Patchouli, Orange, Grapefruit. Undiluted. Warriors of the Past used Cloves to prepare them and give them Strength in Battle. 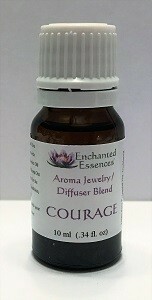 Bring Feelings of Courage, Strength, Confidence with the Aroma of this Blend. For Use in an Aromatherapy Diffuser or on Aromatherapy Jewelry. Do not use Undiluted on the Skin. Keep Out of Reach of Children.. Enjoy the Benefits of the Therapeutic Properties of the Essential Oils in this Blend such as antimicrobial, antifungal, antiseptic, antiviral, aphrodisiac, antidepressant, mood enhancer, stimulant. For more Information on the Benefits of Pure Essential Oils see Our Links/News page for websites that offer Educational Material.